We’re all very excited today here at Event Hire UK due to the fact that our new 40ft artic trailer has arrived with full Event Hire UK livery and it looks fantastic! Of course, not only does the livery and branding look great, but the most important role of this artic trailer is to transport furniture hire and catering equipment hire products to large venues up and down the country. 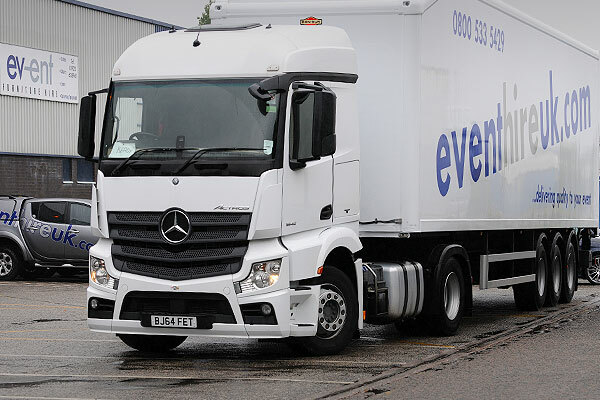 Equipped with a hydraulic tail lift, this valuable addition to our existing fleet of trucks and vans provides our logistics teams with the ability to transport large volumes of equipment to ensure that our clients receive their furniture such as chair hire, table hire and much more, on time and in the large quantities they need to hit their event deadlines. Of course, any business thrives on how efficient it is, and this is new addition to our fleet represents yet another step for Event Hire UK. Event Hire UK provides furniture hire, catering equipment hire, cutlery hire, glassware hire and event crockery hire to event organisers, large and small, working tirelessly behind the scenes to produce fabulous events, from weddings and corporate hospitality events through to outdoor theatres and concerts, festivals, trade shows and exhibitions. With over 650 different product lines stocked in large quantities, it’s no surprise that event organisers turn to Event Hire UK to provide the range, quantity, quality and price on the hire equipment they need from our network of sales and distribution centres around the country. So, the next time you’re driving on one of Britain’s motorways, look out for our arctic trailer – it’s difficult to miss!